Turtle Lodge is located at Sagkeeng First Nation (On Google maps: 47071-F Hwy 11, FORT ALEXANDER Indian Reserve, MB, R0E 0P0. 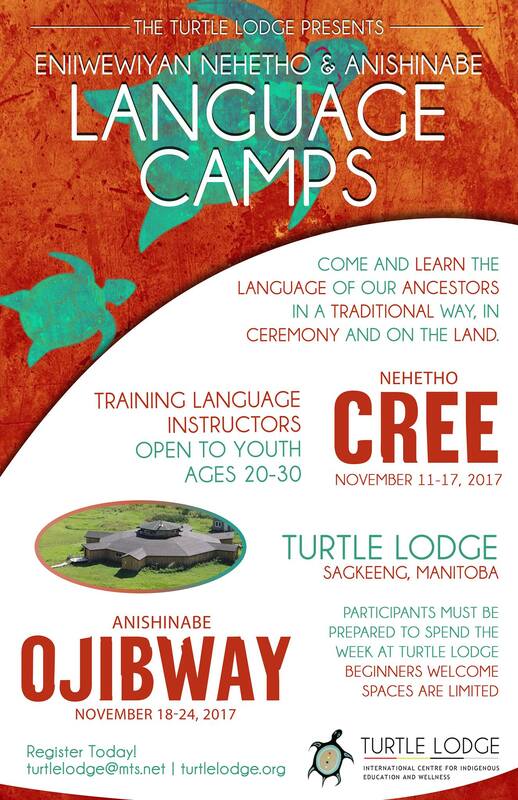 Anishinabe (Ojibway) and Nehetho (Cree) Language Camps at Turtle Lodge, November 11-24: Nehetho Camp Nov 11-17, Anishinabe Camp Nov 18-24. Come and learn the language of our ancestors in a traditional way, in ceremony and on the land. This camp is for training language instructors, and open to youth ages 20-30. Participants must be willing to spend the week at Turtle Lodge. Beginners are welcome, spaces are limited. The program is free of charge. Participants will be asked to provide their own transportation to the Turtle Lodge, and bring their own bedding. A list of items to bring will be provided once registered.